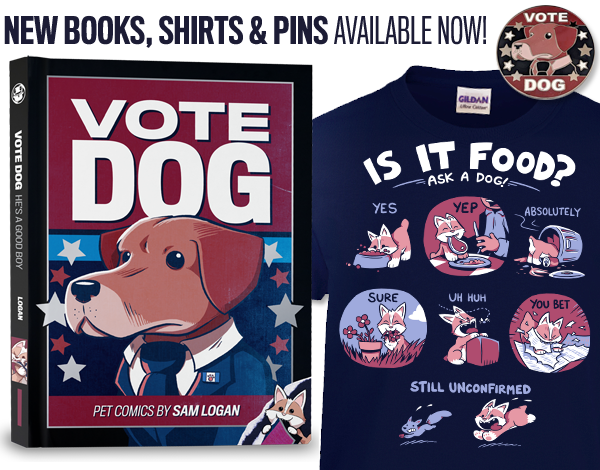 If you haven't already, I definitely recommend you check out Vote Dog: my big book of comics starring Butcher, Baker, President Dog, Buddy, and other critters! 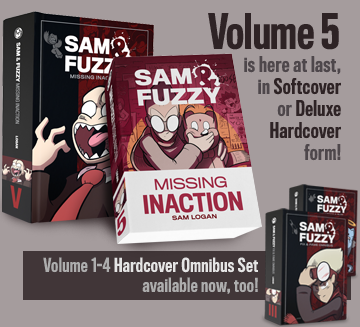 I created a bunch of brand new comics just for the book, as well as a number of expanded or updated ones. There's even a special appearance by Rikk and Chompy! Anyhow, that's all for today. Come back on Wednesday for our next comic! Pure, raw tar responds to ambient thoughts. Thoughts can shape it and cause it to transmute into new life. But on the flip side, tar is very dangerous to the people doing the thinking, and can cause brain damage if they come into contact with too much of it. Memory loss is one of a few possible options, depending on the severity of the exposure. Anyone with a brain, human or inhuman, can psychically interact with the tar in this way. But inhumans have an additional vulnerability... they were created from transmuted tar, and exposure to sufficient quantities of it will cause their bodies to break back down. But Demons like Brain and Hart are something special. They're tar that, over time, developed a mind of it's own and took control of itself. They've achieved what all those Comittee scientists always wanted... they're able to (mostly) control the tar's powerful, otherwise unpredictable effects. That's why they're able to touch inhumans without disolving them, and use the tar's psychic abilities to do things like read and hijack minds. But it's also why Brain has, on occassion, wiped some or all of a person's memories by accident. It's difficult to control, even for him! "I only recently made the connection (mostly because of how prominent the Tar is in the current storyline), but the Tar seems to be very similar to the slime from "Ghostbusters 2". It's a liquid-ish substance that reacts to mental processes (for the slime, it was emotions, for the Tar it seems to be more related to thoughts), it seems capable of spawning sapient beings (ghosts in Ghostbusters don't necessarily come from the slime, but the courtroom scene shows that emotionally-charged slime makes ghosts appear), it flows underground in vast quantities, and being splashed with it can have direct consequences on the individual, including harmful ones. Not a conscious inspiration, no! But I can see why you'd wonder! Here's a telling detail about me: although I was a kid in the 80s and 90s, and was generally interested in geeky stuff, I did not actually see either of the Ghostbusters movies until I was an adult. The same actually goes for Star Wars, every Indiana Jones film other than Raiders, and a lot of other movies that are often seminal favs for guys my age. Childhood me was really, aggressively not interested in live action films. I loved cartoons and animation, and that was about 95% of what I watched until I was at least a teenager. So long story short, almost all my memories of Ghostbusters are from the animated series! I know I did watch Ghostbusters II at some point, but to be honest, I'm not sure I could have remembered the plot well enough to summarize it, and I don't remember liking it much. I guess you could say that, in that particular case, bustin' did not make me feel good. Ha! That's a wrap for this week, team. See you on Monday for our next comic! 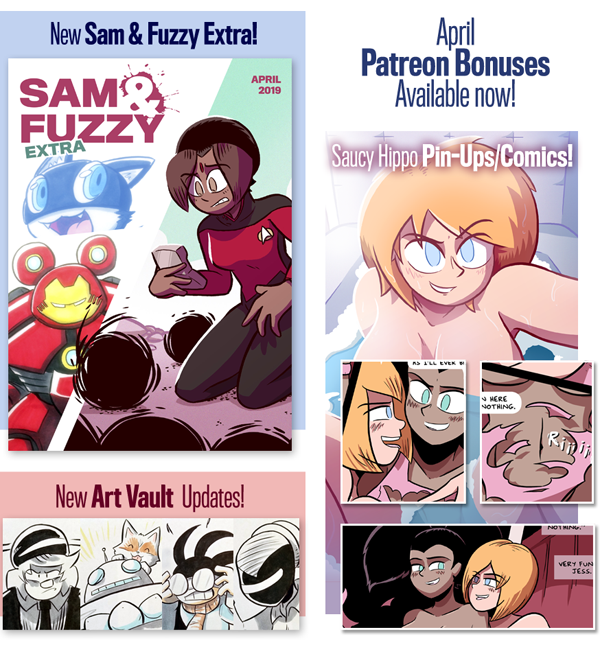 I'm going to be pausing our main story extremely briefly while I catch up from returning from my vacation, but there will be a brand new comic of a different sort, and we'll be back to the big saga again before you know it! Don't worry! 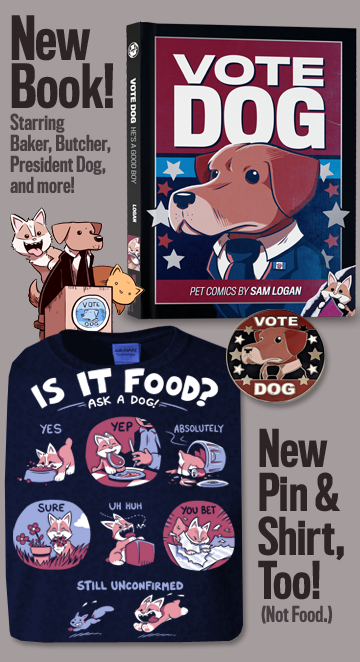 Aaron and Lance are here to take care of Butcher, Baker, Buddy, and all the other critters. Or at least, they're here... for now. We return on Friday with a new comic and a new round of Q and A! As always, if you've got a question for me, just pop it in an email with "Q and A" in the subject line.